The difference between English and Western styles of riding are defined by the practicality of their saddles. Western saddles and style are uniquely American, developed during the 1800s by cattlemen. Western saddles have deep seats to provide comfort and security during long hours of ranch work. 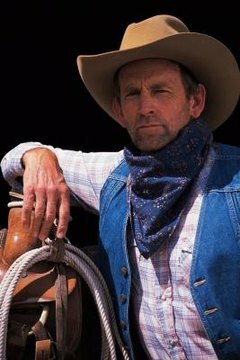 A Western saddle's horn, used to secure a lariat while roping cattle, is tall. You secure a Western saddle differently than you do an English saddle: An English saddle uses billets with a buckle girth; the Western saddle secures with a latigo, cinch and cinch knot. Always saddle a clean, dry horse. If your horse is wet, allow the horse to dry in the sun, or towel the horse dry. Dirt and moisture trapped between the saddle and the horse can cause painful saddle sores, girth galls or blisters. To clean your horse, curry the horse in circular motions with a rubber curry comb to loosen the dirt. Use a stiff dandy brush to flick dirt off the horse. Place your saddle pad or blanket high on your horse’s shoulders and slide it down toward the middle of your horse’s back. Doing this ensures that the hair under the saddle pad stays smooth and prevents hair from being rubbed out by friction between the saddle and your horse’s back. Once the saddle pad is in place, the pad should lie equally on both halves of your horse’s back, the front of the saddle pad resting on your horse’s withers. While holding your Western saddle with the horn in your left hand, take your right hand and hook your right stirrup and cinch over the horn. Doing this prevents your horse from being slapped and bruised by hanging stirrups when you place the saddle. While standing on your horse's left side, gently place the saddle on your horse’s back. Make sure the saddle is sitting evenly on the horse's back and that the pad has not slipped or wrinkled under the saddle. Properly seated, the saddle should have about 2 inches of pad in front of it. Pull the front of your saddle pad up and under your saddle’s horn. Doing this provides airflow under the saddle and prevents pressure points on your horse’s withers. Walk to your horse’s right side. Unhook the cinch and the stirrup from the horn and let them hang freely. At this time, check the right side of your horse’s tack and make sure the pad and saddle are centered on the horse’s back and free of wrinkles. On the left side of your horse, hook your left stirrup on the horn and reach under your horse and grab the cinch. Take your saddle’s latigo and thread it through the buckle of your cinch and back up to the saddle’s large D-ring. Lace the latigo through the cinch’s buckle again, pulling it tightly to cinch it snugly against your horse’s ribcage. Tie the extra length of latigo in a cinch knot or a Texas T-knot. Pull the end of the latigo through the D-ring and pull it toward your horse’s shoulder. Then bring the end of the latigo across and toward the rear of the horse to form a loop. Bring the end of the latigo under the D-ring and through the center of the ring, toward you. You should have a horizontal loop right beneath the D-ring. Pull the end of the latigo under the loop and tighten it by pulling in a downward motion. Unhook your left stirrup. Check again that your saddle is still centered on your horse and that your cinch is snug. Your cinch should be tight enough to prevent your saddle from rolling but loose enough to allow your horse to breathe. A good test is to place one finger directly under your horse’s stomach and slide it between the horse and the cinch. Your finger should fit between the cinch and the horse, but it should be a snug fit. To tighten your cinch, pull the latigo upward and tighten the cinch knot. Always double-check your cinch before mounting -- as your saddle settles onto your horse’s back, the cinch will naturally loosen. ⚠ If you are unsure if you saddled your horse correctly, ask an experienced horse rider to check your tack. Ill-fitted tack is dangerous to both horse and rider.